I returned to Ramana’s in September and am now taking my first break in five months so thought it was about time I updated everyone on what has been going on. I’ve rewritten this many times as my feelings and reflections change each day. I apologise to the grammar police out there as this is poorly written and is more the random thoughts of a tired mind. What I have realised is this is a ‘job’ I love, live and breathe. At no point working as an actuary did I talk with passion about my job or have people show an interest in it. I’ve been in Goa for two days and already have people ready to come and join us at Ramana’s because they see how passionate I am about it. The closest I have come to this in my many previous jobs is when I worked as a chef. Then I could talk for hours about fresh ingredients, new and classic recipes and all the drama that working in a kitchen entails. Much like working in a kitchen if you look after your ingredients and realise that every different ingredient needs to be looked after in a different way children are the same. You need to nurture each individual child as no child is the same, no child learns and grows in the same way but every single child deserves to be loved. People often ask me what being the manager at Ramana’s involves, well it involves the most random list of jobs you could imagine. The ‘typical’ day in the last five months I’ve looked after the children, given tuition in Economics, Art, Maths and English, been to the mountain to check on sick goats, unblocked drains, gardening, swept a chimney, stopped an illegal sewage line being built and stopped a local hotel owners stealing vegetables from our garden. It has had moments of joy and moments of tears and I wouldn’t change it for the world. I’ve seen kids sick with dengue fever, colds and something I relate to more than anything – acne. I myself was sick for two weeks with hospital visits and six drips to make me better. If it wasn’t for the watchful and strict eye of Prabha and the kids I’d have been much worse. Never before have I had a child send me to bed to take rest or bring me chai at 6.30 every morning. I’ve removed many children’s lice and they’ve removed mine. I may look after the kids but they look after me too, even if I am too stubborn to listen to their advice. The kids are what makes the long days and tiredness all worth while. Sometimes I feel like I’m running on empty but if someone gets sick or upset I instantly forget my tiredness and suddenly the whole world can feel perfect when the kids give you a massive hug. It is a sign of how amazing these kids are that they’ve persuaded me to sing twice in public (God bless them as my singing is horrendous, Emlie Sande I’m not!). Our kids face many of the same complaints as I did growing up … “I don’t like green vegetables” …. “He won’t let me have a shot of the swing / tennis racquet / game” but there start in life is much harder so is incredible that they overcome these difficult starts and go on to university. Never have I felt so fortunate to grow up in a country with free education, university and healthcare: I’ve been epileptic since a child, in Scotland my medication is 100% free but in India it is £6 per month and university averages £2000 per year in a country where many people earn £40 per month. It makes me very proud to be Scottish that we continue to offer free education, health care and are welcoming refugees to out country. Anyway enough wittering on, I could write the equivalent of war and peace so will stop now. Hope I’ve given you a flavour of what it is like to be the manager at Ramana’s. 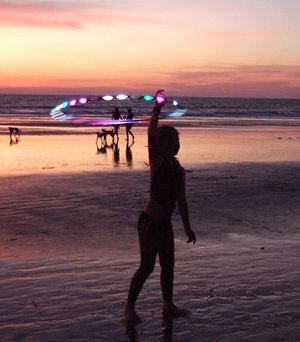 I was first inspired with the idea of making Hula hoops with children in India from a visit the previous year when I was watching the sunset on Arambol beach in Goa along with the many hundreds of other people and assortment of performers with their hula hoops, juggling balls and the like. 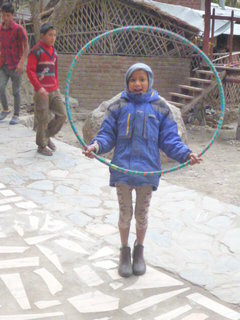 There was a young hula hooper doing some amazing moves and tricks when she was approached by three young Indian children, 1 girl and 2 boys and they were eager to have a go on the hoops. The hooper reluctantly gave 2 of the hoops to the children and the little girl picked it up instantly and was having fun and the children were laughing. One of the boys had a turn also. To see this bought joy to my heart as I also know the joy that a hoop can bring to a child of any age, whether we are 8 or 80 years old! (I’ve been making hoops and teaching classes for the last 5 years). But it was especially important for these children who did not look like their lives were ones of fun and play, quite the opposite in fact! 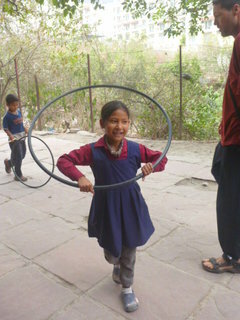 I was shocked when the Hooper suddenly snatched back the hoops and started to taunt the young girl with it instead. 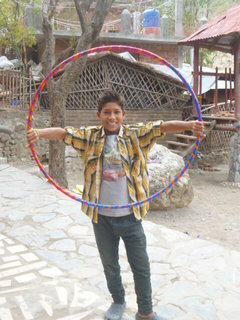 That was the very moment when I decided that on my next visit to India, I would be armed with the means of making hula hoops for the children of India! It wasn’t until a few months later back in the U.K. That I happened to mention it to my housemate Kutira saying that I intended to go and work in an orphanage and make Hula hoops with the kids. 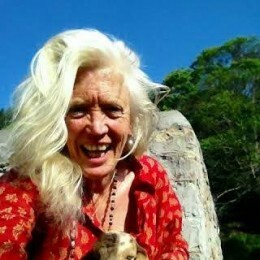 Kutira told me of her good friend Dwabha who had set up and been running a Children’s Home for many years called Ramana’s Garden in the foothills of the Himalayas. And that was that decided! I checked out their website www.sayyesnow.org and wrote an email to Dwabha telling her of my idea and asked if she thought it was possible for me to do this. The reply came a short while later and the answer was YES! It was all systems go, next I arranged an extended amount of time off of my work with Alive Activities (aliveactivities.org) where we go into residential care homes settings and essentially bring people back to life through music, guided reminiscence and stimulating activities and fun! Luckily they were more than happy to support what I was doing and gave me their blessings! I arrived in India on 8th January, 2015 with one rucksack which also contained 100 hoop connectors, a pair of pipe cutters and rolls of sparkly tapes for decorating the Hoops! 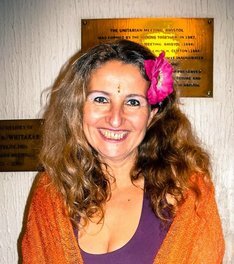 My first stop was Candolim in Goa where I “landed” and acclimatised whilst meeting up with fellow Sannyasin friends. It was a few days in when I heard that Dwahba was there too! And only for 2 days! What were the chances of that happening? I had no idea what she looked like but friends were keeping an eye out for her for me and would connect us but they said you will know her, she is unlike any other, tall and blonde and with a majestic air about her. And they were right! I spotted a woman of this description going into the sea so I waited until she came out. I went over and introduced myself and we chatted for a while and then Dwabha asked me from what was I going to make the hoops? Aha! She advised me to find the piping in Goa and to send it up to Rishikesh as she said she doubted if I could find it up there. Having decided to go on a mission to the hardware stores in Goa, I met a hooper in Arambol who assured me that any hardware store would sell this piping. So I took her at her word and, wanting not to have the hassle of carrying or posting the piping all the way up to Rishikesh, I arrived there empty handed with the trust (and hope!) that I would find it! Arriving in Rishikesh was a joy! I had no idea what to expect but I was mesmerised by the aqua colours and flow of the River Ganges and would love to sit and watch the flow of life from my bedroom balcony and also from the very popular German Bakery overlooking Laxmanjula bridge which teemed with life in both animal and human form! I was enchanted with the cheeky monkeys that hung out and played at the bridge, the cows wandering across along with hordes of people stopping to have their pictures taken, feeding the monkeys and motorbikes that crossed. Such a festival of activities all in such a short amount of time and limited space! So many Pilgrims, temples, Satsangs, Yoga schools, a real Spiritual Mecca of the North! All alongside the Western travellers and seekers, the Sadhus, the beggars, the locals doing their washing and bathing and the tourists going down the Ganges whooping with fear and joy as they navigated the tides and rocks of the Ganges. And of course not forgetting the reason for my visit – Ramana’s Garden! My first attempts of finding the right material for making the Hula Hoops were not successful. In fact the first lot on the unravelling was actually Garden hose pipe! This was not an entirely wasted exercise as I gave it to the Children’s Home for their Organic gardens where they grow their delicious vegetables for their amazing Organic Cafe which is very popular with the tourists – the queues are often out the door for people wanting to eat there. In the meantime I chatted to a fellow resident at my guest house, (to stay at the orphanage you need to be a volunteer there for 2 months) and shared my mission to find the right materials. He took up the challenge and found a cane factory where he had 3 hoops made up for me but this proved a rather pricey option. As time wore on I began to have creeping doubts as to whether I would find it here and felt bad at having let the children down and made an empty promise. Of course this just fuelled my determination to find the materials. In between all this I came down with a heavy head cold which knocked me flat for a few days. Luckily there was a restaurant downstairs so I got myself down there for lots of lemon and ginger teas and hot food. It was pretty cold in Rishikesh and just having come from Goa where the temperatures were above 30 degrees it was a shock to my system! Once back on my feet I went back to the local town which if you know India is sometimes no simple task! There is no car access to Laxmanjula so to get to the rickshaw stand is a walk across the narrow bridge (hence all the motorbikes which actually aren’t allowed on the bridge but this is India, anything goes!) and then up the steep steps across the marketplace and then up another hill which is lined with shops, market stalls and restaurants and a taxi stand which has set prices much higher than a price of a rickshaw. Being a traveller at heart I take the next part of the leg-killing walk up the windy path and steps which were designed for longer legged people than myself and finally to the rickshaw stand! Here the next set of negotiating comes into play for the price of the fare. And even this doesn’t guarantee that you will leave in the immediate future, the drivers like to wait, naturally until they have a full load of passengers, so I usually needed up encouraging others walking by to come with us so we could set off. It is all part of the game and I love this about India! So finally we are off! 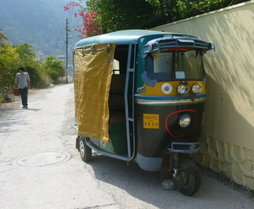 I am dropped in the busy Main Street of Rishikesh and find a place to start. On the 2nd shop I call in at, I make a breakthrough and the man writes down the name of the piping I am after on a piece of paper in both Hindi and English and then I take this into the next places. I hit the jackpot in Asia Paints. It is a hardware store similar to ones in the U.K, similar to my brother’s painting and decorating shop that he had for many years where I sometimes worked. There were no women to be found in here though! The man told me to go out the back with 2 other men which on paper looks dodgy as hell and in hindsight pretty risky and as we went out of that building into another and down into the basement the very thought crossed my mind! Thankfully all was well and they showed me the pipes and there it was! So I ordered 45 metres of it at 20p a metre! I was so, so excited and delighted! People on the streets looked at me with both shock and amusement as I carried this huge reel of piping over my shoulder. I arrived back at the orphanage triumphant! The next solution needed would be how to melt the ends of the pipes once they were cut to put in the connectors and join the hoops. Luckily I had a helper James, a lovely young guy from Australia who had been working at Ramana’s for a while doing maintenance work. Back home I had an old kettle to boil the water for the hoops and would stick the ends in the open kettle. Here in India though we didn’t have the luxury of instant access to a kettle. The man in the shop suggested fire for melting the ends but Dwabha rightly said no, not only for the toxic fumes but also for safety reasons. Our solution came in the form of disposable lighters! We bought up 8 lighters from one of the local stores and after I measured the pipe lengths and James cut them, I held the lighter underneath the ends of the pipe and then James put the connector in that end and started on the next end. And it worked!! I ran into the Cafe to find Dwabha to tell her the news and it was such an amazing feeling to know that it was all possible and was really going to happen! Of course the children were gathering around watching us in curiosity and anticipation and as soon as the first hoop was made, it was off! As was the next and next and so on until the whole outside space was filled with children delightedly hooping and playing with the hoops. I stood there and cried! It was the most touching thing I had seen! And the joy it brings, a simple hoop! And So much fun! They were all such naturals, I didn’t have to show them how to do it at all! 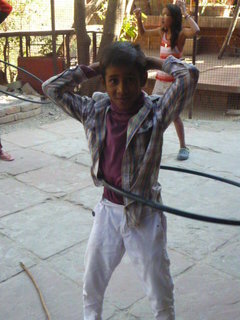 The boys had developed their own games with the hoops, rolling them upright and using sticks to guide them like you see in the pictures of Victorian days with kids doing the exact same thing! The boys were charging up and down the playground, racing each other. Some of the children were skipping with them, some round their necks, on their arms, they were complete naturals! Two days later on a rainy afternoon some of the children decorated their hoops with the shiny tapes I had bought over with me from the UK and were totally engrossed in this for two whole hours! Here are some pictures of their masterpieces which they were very proud of and rightly so! And so my work here was done, I had achieved what I set out to do and the incredibility of it all hit me, that I had an idea, one that I may have dismissed as a “one day I would like to…” and then I went for it and it all fell so perfectly into place and the results were truly magical! 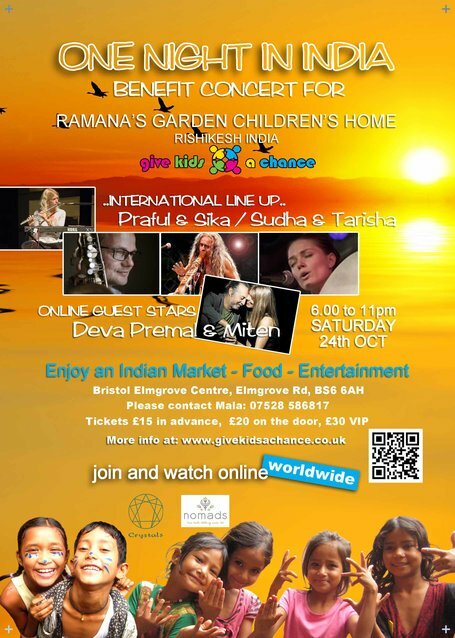 I was truly touched by my time at Ramana’s and before I left I talked with Dwahba and said I wanted to help them with their fundraising and had an idea to put on another One Night In India as I had done in 2013 in Bristol, but this time as a fundraiser for Ramana’s. I set off from Rishikesh back to the UK with the seeds of an idea that was set in motion upon sharing it with my housemate Kutira. She also wanted to support her friend and the incredible work she was doing with the children of Ramana’s and the rest, as they say is history! Our “One Night in India, Give Kids a Chance” benefit concert with wonderful musicians, food and Indian market…and Dwahba! 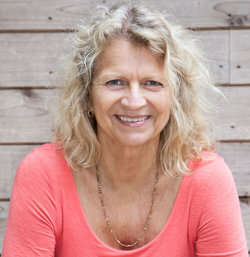 takes place on 24 October in Bristol, UK and will be livestreamed around the world. See our event page to join us in person, via livestream and to support the amazing gift of Ramana’s Garden Children’s Home. Get our occasional email updates and details of how to join the free Livestream of the October benefit concert.